BGP can carry many different network-related information, sometimes described as address families or NLRI (Network Layer Reachability Information). One of them is FlowSpec (RFC 5575), which allows BGP to propagate a filter for a specific IPv4 packet flow. A flow, which is defined by an n-tuple, like a combination of source and destination IP address, protocol number and ports, can be discarded, rate-limited, redirected to some analysis or mitigation device etc. BGP is simply used to signal the routers to perform appropriate filtering actions for a certain flow. BGP routers in the mesh learn what to do with the traffic that matches the n-tuple – for example, they can drop it or limit it to a some harmless rate. This technique makes BGP routers act like a big distributed firewall that can be easily programmed to mitigate some malicious traffic, a DDoS, for example. The added value of using BGP to propagate filtering information is that DDoS mitigation actions are distributed across the network and therefore closer to the source of the attack. The malicious flow is signaled within the iBGP core and the attack from upstreams is blocked at the entrance routers. If the upstream provider supports BGP FlowSpec, the mitigation can be done even closer to the source of the attack. 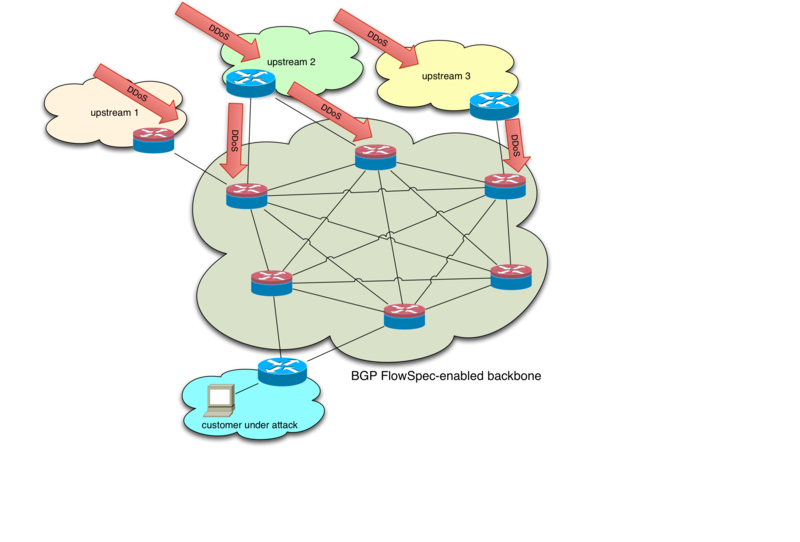 The originator of a flow route matches the originator of the best match unicast route for the destination address that is embedded in the route. There are no more specific unicast routes, when compared to the destination address of the flow route, for which the active route has been received from a different next-hop autonomous system. Please, check Juniper documentation and RFC for more details. The feature has been implemented in GRNET – Greek academic, research and educational network as a Firewall on Demand service (here is an interesting talk by Leonidas Poulopoulos from GRNET at 2nd SEE Regional RIPE Meeting in Skopje).